(From the website) This exhibition invites you to explore L.M. 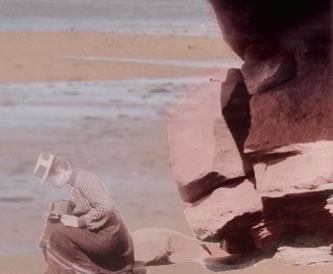 Montgomery's life (1874-1942) and visual imagination through a sample of her personal scrapbook pages and book covers, found in five Canadian archival and museum collections. For the first time, viewers may see in one place a sample of the images Montgomery collected, created, and inspired, including souvenirs, photographs, and cover art. Dr. Elizabeth Rollins Epperly, founder of the L.M. Montgomery Institute at UPEI, is the curator of this virtual exhibition, which has been avaialble on the world wide web since August 2002.